AC-SHO5B Our classic 5B design, crafted in Japanese white oak. 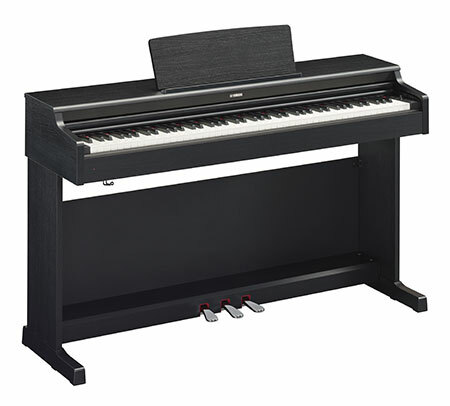 For the 5B player looking for a denser stick with more power and articulation. AC-SM5A The Stagg 5A Maple Drumsticks are excellent for lots of different genres, and inexpensive. 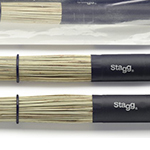 AC-SH5AN This Stagg 5A size pair has a bright cymbal response thanks to the nylon tips. AC-BJR The Vic Firth Jazz Rake Red Plastic Brushes Retractable thin, flexible bristles for fusion and jazz. Also great for use on electronic kits, such as the Roland V Drums.flexible bristles for fusion and jazz. 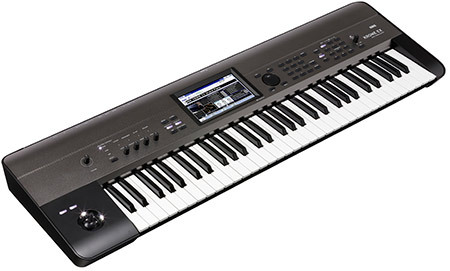 Also great for use on electronic kits, such as the Roland V Drums. 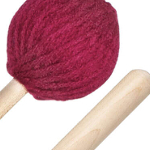 AC-SMTIMF38 These great inexpensive Timpani mallets feature a maple handle and 1.5 inch round felt head. AC-SBRU30RS Polybristle straw brushes with black rubber handle grip great for textural work on drums and percussion instruments. AC-SBRU35RS Polybristle straw brushes with black rubber handle grip great for textural work on drums and percussion instruments. 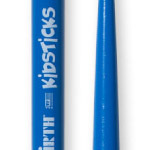 AC-KIDS Engineered to make playing easy for the very young drum set player - ages 3 to 8. 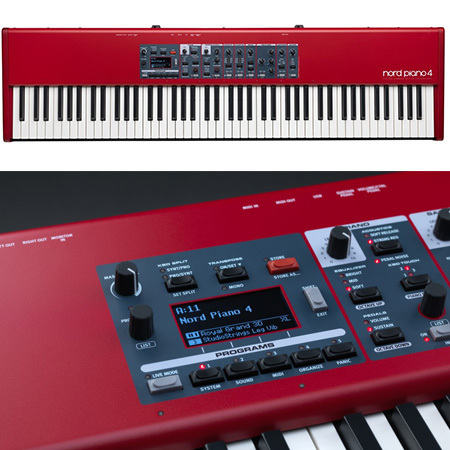 Produces a quality sound. 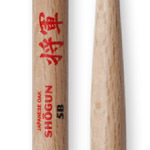 AC-SH5A An inexpensive yet high quality pair of hickory wood tip sticks. 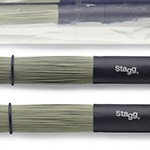 AC-BR261 This pair of telescopic wire brushes from Stagg are very good quality, with a metal pull rod that can also be used as a cymbal beater. 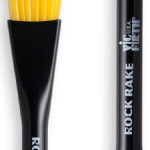 AC-BRR The Vic Firth Rock Rake Yellow Plastic Brushes has retractable stiff, thick bristles for greater projection. 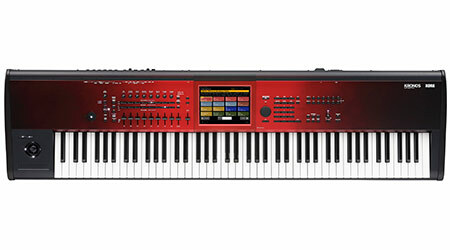 Also great for use on electronic kits, such as the Roland V Drums. 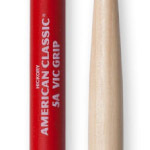 AC-5AVG Vic Grip is a new anti-slip drumstick coating made from an eco-friendly, water based urethane. 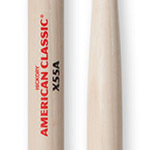 It provides a comfortable and slip resistant grip to the American Classic 5A Drumstick. When entering the world of drumming, you cannot do anything until you own a pair of drum sticks at the very least. Having said this, do not broach lightly as there are hundreds of different stick choices and this all comes down to personal taste. To make life easier for any beginners, we keep a regular stock of the most popular stick choices including the 7A, 5A and 5B. 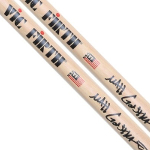 We currently hold these stick choices in Stagg and Vic Firth. If you can't find your choice of stick on our webpages, give us a call and we can order any Stagg or Vic Firth stick model into store for you.